There are few technologies that have been as disruptive as VoIP. For example, cloud hosted VoIP has several benefits that businesses are attracted to. However, that is just one aspect as costs are cut dramatically. While that may make it sound like a negative development, that is far from the case in the instance of IP telephony. In tech circles, “disruptive” means something coming along that challenges conventional notions of specific devices and services. In the instance of voice connections, VoIP has liberated both private users and enterprise operations from the limitations of landline telephones. By placing and receiving calls over the Internet, costs can be lowered and systems can be more easily manipulated through a digital interface. This is what truly makes VoIP a disruptive technology – it’s inherent flexibility. Be it addition of new extensions, the activation of hold music or undertaking the quest of unified communications and collaboration, VoIP has taken voice to new places that were once only the stuff of dreams for many companies. It can be taken further with greater ease than its copper-based predecessor ever could have been. Simply put, it changed the game. 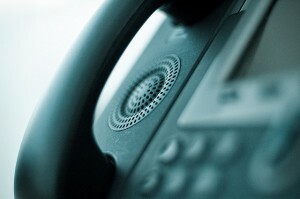 The flexibility of VoIP is altering business phone service in a major way. By running voice signals through data lines, organizations of all kinds stand to gain advanced telecom infrastructures. VoIP phone services improve efficiency in the area of client communications. This is one of the reasons VoIP telephony has disrupted business norms. Instead of having to travel all the time to meet with and speak with clients and business partners, you can meet them right from the comfort of your home office. VoIP services allow you to choose where your calls ring. They even allow you to choose how your phone rings. If you would like the first two rings to go to your office phone and the next rings to go to your cell phone, this can be done. This allows for more efficient client communication. You will no longer have to worry about missing an important call or spending company money on lots of business travel. One of the big benefits of VoIP is that it does not require excessive wiring to add a new line. Not only that, but the digital nature of VoIP telephone service means that extensions can be removed with just as great of ease. Are some employees who will need network access only coming aboard temporarily? It used to be that businesses needed to take on the extra costs associated with keeping certain extensions in their arsenal of connections. Using VoIP allows these lines to be added and eliminated almost at whim, with no additional cost beyond what will be paid to use it when the situation arises. This is especially useful in the healthcare industry. However, all other business types can benefit from it as well. There are plenty of voice advantages that can easily be taken for granted. It used to be much harder to set up things like voicemail and call waiting, namely on the large scale that companies demand. But with business VoIP, getting these tools into the hands of the people that need them can be as easy as clicking a mouse. Telephony features like call forwarding, voice-to-text message transcription and more are able to be brought into the fold without the complications that were once indicative of phone networks. Staff members who have access to these abilities are likely to be much more productive than was possible previous to a VoIP deployment. There has been a stark segmentation of many telecom devices that has held organizations back for years. Voice has, on many occasions, needed to be used in a meaningful way with tools like email, but the technology just didn’t exist – until more recently, that is. Now that phone calls are being viewed more as just another digital connection, many of the walls preventing unified communications are coming down. VoIP phone services, when utilized effectively, are the definition of flexibility in terms of working alongside other channels. That is why VoIP services are one of the hottest unified communications trends in many years. The modern workforce is much different that the ones of previous eras. Thanks to new technology, there is a greater importance placed on being able to balance work and home life. Because they have the ability to effectively work from wherever they want to, employees are starting to demand the option to work outside of the office. What VoIP Should You Be Using? You are probably intrigued by all your business stands to gain from using a VoIP service at the office. So that begs the question, “What service should I be using?” Well, in 2016, the absolute best VoIP provider you will want to give a shot is none other than Vonage. This company has been providing VoIP solutions for quite a bit of time now, and it shows. With an incredibly vast array of features provided in the business edition of the application, you simply cannot go wrong. You can have up to 30 participants on a single call at no additional cost. You can even host a video conference with their services. In addition, if you need a little bit of assistance, Vonage’s SIP phone support is there to help you out. If you want to bring your business into the 21st century with the best VoIP phone service, Vonage is an excellent company to try out first. Present-day enterprises need to present themselves as relevant and forward-thinking – both to their customers and their staff members. By undertaking a VoIP integration initiative, organizations of any kind can build strong morale among their employees while fostering innovation. Your style is so unique in comparison to other business websites I have read stuff from. Many thanks for posting when you have the opportunity, Guess I will just bookmark this blog. Anyone can benefit from this.